I hope you are all having a wonderful Tuesday so far! It's very windy here today so it's a great chance to catch up with my blogging. 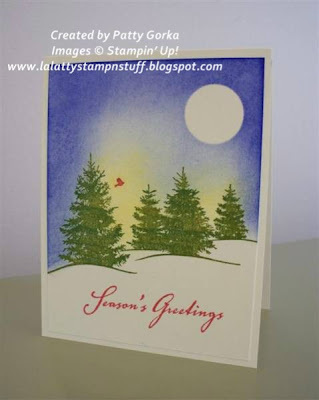 The card I'm sharing with you today is another CAS Christmas card that I made for my card swap that just finished up. I realize that I've made similar cards like this before, but this time I've decided to turn my card vertical and I've added a moon in the upper right hand corner. And talk about easy, this card is about as easy as it gets and it just goes to prove that you don't need the newest, fanciest tools to create an amazing look. The first thing I did to create my card was stamp my tree images and I did this by first inking my stamp using old olive ink and then using my garden green I sort of tapped the end of my ink pad right over top of it. This is what gave me the two toned green look on my trees. Next, I wiped the green ink off the bird part of the image and then I colored it using my real red marker and stamped it onto my white card stock. My next step was to create a mask for the moon by punching out a 1" circle and applying it to the upper right hand corner. I removed this mask once I was finished sponging my background. To sponge my background I did not do any masking, I simply inked up my sponge and starting with barely banana I sponged behind the trees. Next, I started sponging the blue part of my sky and I started with the lighter blue and then I worked outward going onto the darker blue. And to finish off my card I simply stamped my Season's Greetings sentiment. I decided not to add any ribbon or any other embellishments on my card because I felt that this way it would be good for mailing. Thanks so much for stopping by and tomorrow I will be posting the last of three CAS Christmas cards that I made for my CAS Christmas card swap. Have a great rest of the day! You created a beautiful scene on this lovely card! Oh, this is beautiful! And you did it all with a sponge! I totally thought you brayered it! Lovely! Hello Patty,I thought I seen this card before.You did an awesome job with the background.I love it. Simply beautiful Patty. Oh, I need to get this stamp set out again. You have inspired me! Beautiful! The little red bird is a nice detail. I also love your two tone stamping! what a beautiful christmas card. the scene is so peaceful. What a beautiful winter scene! Lovely card!